Have you seen the More Cowbell sketch from Saturday Night Live? It’s more than just funny. Believe it or not, it’s a powerful metaphor for a successful work life. And it provides insight into the kind of people you need on your team, and what makes an effective team. Everyone has at least one cowbell — it’s your unique, profitable talent people pay you for or your company’s unique offering. It’s something people have a fever for. When you discover it and give those people a ton of it, you gain success and happiness for both yourself and others. It’s a win-win. A cowbell is simultaneously something you love doing and something other people really want as well (although, as we’ll see, you still will have detractors and critics). A cowbell creates joy for you and other people. It makes them yell for more. They can’t get enough. Fundamental to having a cowbell is knowing what people want now and what they’ll want in the future. Knowing what people are interested in is also a key to establishing your own value. If you don’t know what people really think about, there is a pretty good chance you won’t be on their mind. Job seekers: Is the career you’re planning likely to be viable in 5 years? Employers: Are you hiring the right people for both now and the next few years? Google Trends can help answer those questions. Google Trends will tell you what gets searched the most and whether it’s growing, flatlined, or declining. You can also find out which countries and cities is something most popular? What related terms are trending? Or you can browse through the fastest-growing topics in categories like business & politics, entertainment, lifestyle, nature & science, shopping & fashion, sports, or travel & leisure. Jennifer Lawrence is the most popular actor, and also the fastest growing. Betty White is second. Derek Jeter is trending most popular in baseball. There has been no change lately in the three most popular animals: dogs, cats, and horses, in that order. The Maze Runner is the most popular book, but The Fault In Our Stars is gaining ground quickly. Frozen has just beaten out Guardians of the Galaxy for most searched movie. Amazon is the most searched retail company and 50% more popular than #2, Walmart. The Ford Mustang is the most popular sports car, the Chevy Camaro is 46% less popular, and there’s no movement in the top 5 positions at all. That’s interesting but not necessarily helpful. Find out what’s trending relative to your business. When you’re still looking for your cowbell, consider your talents and interests. Type them into the Google Trends search bar. You can compare multiple searches. For example, you might compare, “Are people most interested in self-help, success, or making money?” Turns out it’s success. If you’re focused on self-help, you can compare whether self-help or personal growth is the more popular term. It’s self-help. If you have a talent in helping people grow, self-help might be close to your cowbell. Industries like tech and internet marketing are two of the fastest changing there are. If you’re looking at digital marketing careers right now, which kind should you learn? Google Trends says content marketing is the one still climbing the steepest, while many others have leveled off, and a few are declining. Content marketing didn’t really start to get hot as as topic until 2012. For employers, if you’re running a digital marketing agency, you might want to hire some more content marketers! Or pulling out further, should your agency be thinking about growing in marketing, advertising, PR, sales, or social media? 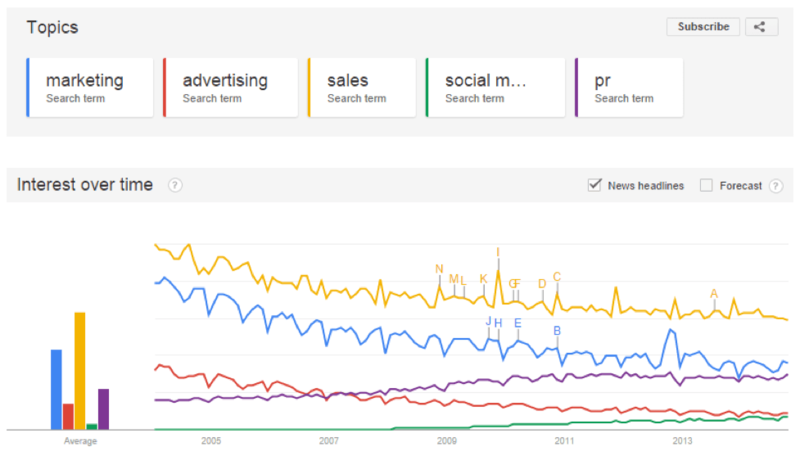 While sales and marketing are more popular overall, interest in both PR and social media is rising. Are there outdated cowbells? Yes, cowbells are obsolete when people no longer have a fever for them. Examples: handshake buzzers, the Walkman, women over 50… just kidding! But seriously, the 40th or 50th birthday used to be a death knell for actresses, but now a number of TV series use older women more prominently. Being a great older actress can actually be a cowbell in itself. 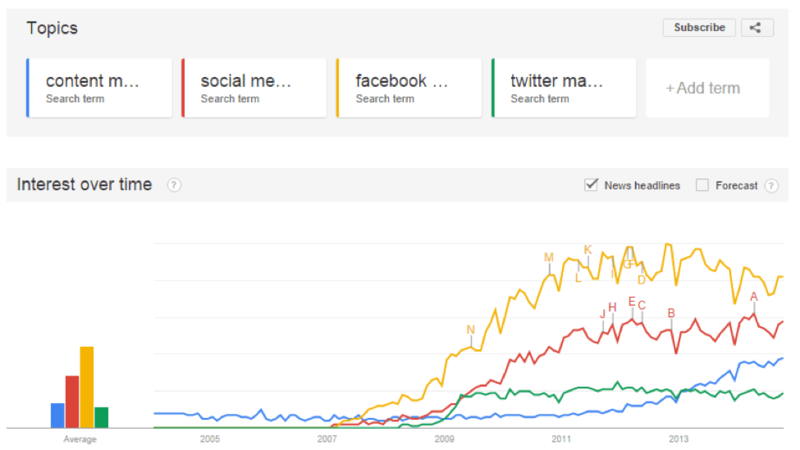 When you’re looking at Google Trends, don’t just look for the most popular. Really explore that niche with multiple searches and see which one has been growing at the highest rate for a year or two. That way, your investments in your career or hires are more likely to pay off.